While not as good as Dirty Harry, Shaft is a very solid entry in the genre. Being a product of blaxploitation, there’s a lot of groovy music, people saying “jive” all the time, and talk of black versus white. All this is part of the movie’s appeal, and while the plot is pretty straightforward and there isn’t that much action per se, Shaft still delivers. Indeed, Gordon Parks creates a great feeling of suspense, keeps things cool throughout, and the final sequence is simply superb. The only fault I found with Shaft is some rather poor sound work, however you get used to it pretty quick. So, while Shaft may turn off some modern viewers used to more action-packed cop movies, I’d recommend you give it a chance. The 1971 hit, best known for it’s Oscar-winning theme song by the late Isaac Hayes, is very solid entertainment that shouldn’t be forgotten. 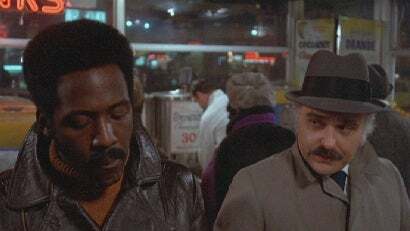 Shaft was a surpise hit upon its release, and was swiftly followed by two theatrical sequels and seven TV-movies, all starring Roundtree. In a failed attempt to resurrect the franchise, a last, eponymous, theatrical sequel was released in 2000, with Samuel L. Jackson taking over as Shaft’s nephew, also called John Shaft. Verdict: A damn good watch. Shaft currently hold a 6.5/10 on IMDB and a 90% on Rotten Tomatoes. This entry was posted in American Films, Blaxploitation Movies, Cop Movies, Movie Of The Day, Movie Trailers, Videos and tagged Air Force One, Bullitt, Charles Cioffi, Dirty Harry, Ernest Tidyman, Firestarter, Gordon Parks, Harlem, Isaac Hayes, John D.F. Black, John Shaft, Leadbelly, Moses Gunn, Richard Roundtree, Samuel L. Jackson, Shadow Conspiracy, Shaft, Speed Racer, Trouble Man by Mr Hollywood. Bookmark the permalink.